Scientists are reporting development of the first "dipstick" test for instantly determining a person's blood type at a cost of just a few pennies. Their study on the test, which involves placing a drop of blood on a specially treated paper strip, appears in ACS' semi-monthly journal Analytical Chemistry, where the authors say it could be a boon to health care in developing countries. The test also could be useful in veterinary medicine, for typing animals' blood in the field, they note. 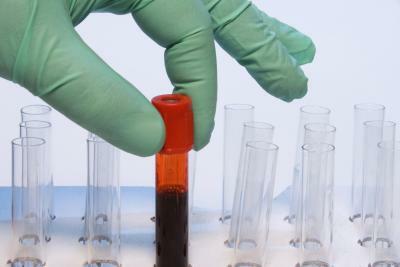 The scientists describe development of prototype paper test strips impregnated with antibodies to the antigens on red blood cells that determine blood type. In lab tests using blood samples from human volunteers, the scientists showed that a drop of blood placed on the strip caused a color change that indicated blood type. The results were as accurate as conventional blood typing. "The paper diagnostics manufacturing cost is a few pennies per test and can promote health in developing countries," the report notes.